Use your own domain to create unique, branded URLs for your landing pages. This helps you look professional and makes your content easier to find. In this article, you’ll learn about how to use a subdomain as your landing page URL. Here are a few things to know before you begin this process. Custom Domains is a paid feature you can purchase to add-on to both free and paid accounts. Make sure you’re familiar with how to create a landing page in Mailchimp. To learn about other ways to personalize your landing page URLs, check out About Landing Page URLs. A subdomain is an extension of your domain name. For example, west.example.com and east.example.com are subdomains of the example.com domain. If you own your own domain, you can verify subdomains in Mailchimp to use as part of your landing page URLs. To verify a subdomain and use it on a landing page, you’ll need to complete a few tasks in both Mailchimp and your domain provider accounts. Here's a brief overview of this process. Add a new subdomain in Mailchimp and generate a CNAME record address. Create a CNAME record in your domain provider's domain manager. In your Mailchimp account, verify the domain. Use the new subdomain in your landing page URL. Depending on the domain provider you use, the terms used to describe parts of the CNAME record can vary. For example, some providers may refer to the field where you’ll enter your subdomain as either Name or Host. Similarly, the field where you’ll enter the CNAME record address provided by Mailchimp could be referred to as Value, Points to, or Address. In your domain provider account, your CNAME record will look something like this. The URLs above are examples only. Replace "subdomain.example.com" with the subdomain you want to verify. Make sure it matches the subdomain you’ve added in your Mailchimp account. Here are some resources for creating CNAME records with popular domain providers. If your service isn't listed here, log in to your provider's site and search their help documents, or contact their customer support team. 123-reg: How do I set up a CNAME record on my domain name? Dreamhost: How do I add custom DNS records? Namecheap: How can I set up a CNAME record for my domain? Network Solutions: How Do I Modify CNAME Records? Yahoo Small Business: How do I add, edit, and delete a CNAME record? To add Custom Domains access to your account, follow these steps. On the Domains page in your Account Settings, scroll to the Landing Pages section and click Buy Access to Custom Domain. Input your Contact address, Billing address, and Payment method. In the sidebar, input your credit card’s CVV. All set! 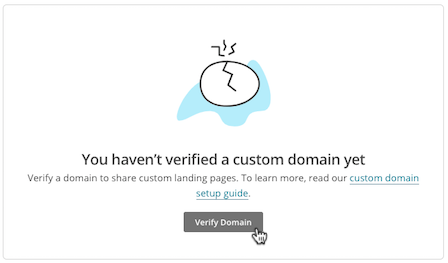 Read on to learn how you’ll verify a subdomain in your Mailchimp account. To verify your domain, you'll need to complete tasks in Mailchimp and your domain provider's domains manager. This process requires you to copy and paste information from Mailchimp to your domain provider's site. We recommend that you work with two browser windows or tabs to easily move between your sites. To verify a subdomain in your Mailchimp account, follow these steps. On the Domains page in your Account Settings, scroll to the Landing Pages section and click Verify Domain. In the Add a subdomain field, type the subdomain you want to use. Copy the CNAME Record address provided. In another browser tab or window, use this information to create a new CNAME record in your domain provider account. Return to the Domains page in your Mailchimp account and click Verify. Verification can take up to 24 hours, depending on your domain provider. When your domain has been verified, we’ll send you an email notification. You can always check the status of verification on the Domains page in your Account Settings. We’ll also send you an email to let you know if domain verification fails. Read on to learn how to troubleshoot a failed verification. After subdomain verification is successful, you’ll return to your Mailchimp account and add the subdomain to your landing page. To add a verified subdomain to your landing page, follow these steps. In the URL section of the landing page builder, click Add URL. Click the radio button next to Use your own domain. Click the drop-down menu and select the subdomain you want to use. Add a descriptive title to the end of the URL. If domain verification fails, here are a few things to check. Was the subdomain entered correctly? In your domain provider account, make sure your subdomain is entered correctly. Depending on your domain provider, you may not be required to enter the entire subdomain. For example, instead of springsale.pottedplanter.com, you may only need to enter springsale in the subdomain field. Do the CNAME records match? Check with your domain provider to make sure your domain name has not expired. After you've finished troubleshooting, you'll need to remove the initial subdomain verification request before you can try again. To remove a subdomain, follow these steps. Navigate to the Domains page in your account. In the Landing Pages section, find the subdomain you want to remove. In the pop-up modal, type REMOVE and click Remove Domain. Repeat the steps to verify a subdomain. The www in the second example is technically a subdomain. If you want to send visitors from your top-level domain to a Mailchimp landing page, you’ll verify the subdomain www.example.com in your Mailchimp account. Then, in your domain provider account, create a 301 redirect that sends visitors from example.com to www.example.com. You can also set up 301 redirects to make sure that any page visitors who search for www.subdomain.example.com are sent to subdomain.example.com. This type of 301 redirect can help you gather better analytics and increase search rankings. Here are some resources for creating 301 redirects with popular domain providers. If your service isn't listed here, log in to your provider's site and search their help documents, or contact their customer support team. Dreamhost: How do I redirect my domain? Namecheap: How do I set up a URL redirect for a domain? Network Solutions: What Is a 301 Redirect? Yahoo Small Business: What’s a 301 redirect or permanent redirect?